Acupuncture treatments at Clasique are offered in a private setting and may include cupping, gua sha, and moxibustion. Your practitioner is devoted to your care, and is fully present to hear your needs and goals. Initial Treatment :: 90 min = $95. Follow up Treatment :: 60-75 min = $75. Initial Session for Student = $75. Follow up Student (high school and beyond) = $60. Initial Session for Child = $60. Follow up Child (newborn to age 12) = $35. Constitutional Facial Acupuncture (CFA) addresses the underlying causes of aging and all manner of skin imperfections to create a visage that is smoother, brighter, has fewer wrinkles, less puffiness/sunken areas, and less sagging. Special needling and massage techniques for the face increase the flow of blood and qi to these cells and through all the channels that connect with it. A series of treatments can change the way your skin self-heals and also brighten your spirit, reflected in the eyes and face. In each of these relaxing 90-minute treatments, we are creating an increased glow and improved complexion in addition to addressing any underlying imbalances. With a series of these nourishing treatments, you not only look better, you feel better. Book an appointment for a free 30-minute consultation if you are curious about how you can use CFA to achieve your goals, or to begin your treatment series. Herbal medicine is a highly effective treatment therapy, and can be applied with or without acupuncture. In an herbal medicine consultation, your practitioner hears your concerns, learns your medical history, and works with you on an herbal treatment plan. Herbal medicines at Clasique include tinctures, pills, granules, raw herbs (for making teas,) and topical liniments and salves. Herbal Medicine Consultation :: 30 min = $40. Essential oils are herbal medicine, too! Many people love the ease of applying essential oils, and prefer to “wear” their herbs, rather than to consume them. 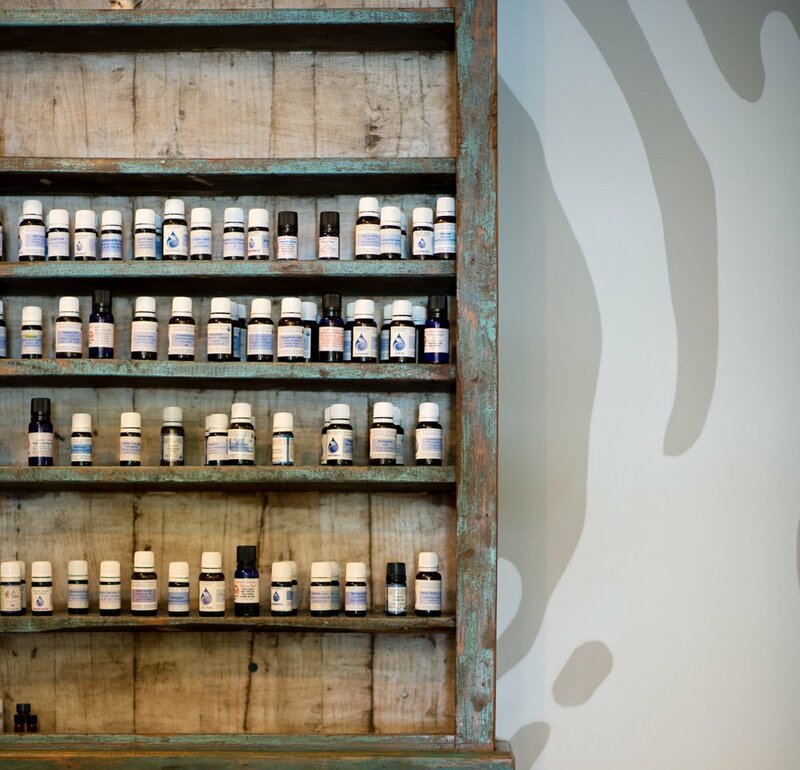 At Clasique, we have a complete apothecary of single, high-quality essential oils that we use to make custom blends. An essential oils consultation is just like an herbal medicine consultation – we learn your history, hear your concerns, and create a treatment plan. The difference is that you receive an oil blend instead of internal herbs. Essential oils are extremely effective, have a wide variety of applications, and safe for the entire family. Essential Oils Consultation :: 30 min = $40. Your Clasique acupuncturists see you as a whole person living a multi-layered life that possesses the potential for great wonder. The Lifestyle Consultation is an opportunity to explore these layers, focus on your complete health, and find appropriate solutions to your lifestyle concerns. Treatment plans focus on lifestyle choices and stress management, and include approaches like food therapy, dietary recommendations, qi gong, and meditation. Lifestyle Consultation :: 30 min = $40. Acupuncture is an ancient, natural healing art that comprises one branch of Chinese medicine, the other main branch being herbal medicine. At Clasique, each of our acupuncturists is also licensed in Chinese herbal medicine. We prescribe custom essential oil blends from our extensive, high-quality pharmacy of oils. Other forms of herbs include tinctures, pills, granules, raw herbs (for making teas,) and topical liniments and salves. Acupuncture and herbal medicine have endless applications, so please keep in mind that we offer care far beyond what is listed here. As a clinic, we specialize in treating people whose health challenges include fertility issues, post-partum depression, cold and flu, upper respiratory issues, digestive concerns, autoimmune conditions, urogenital and reproductive problems, anxiety, sleep disorders, sports injuries, and all types pain. We also love working with babies and toddlers, and have methods other than needles for them- like acupressure, gua sha, and herbs. In addition to being trained in the technical practice of acupuncture and herbal medicine, our personalized treatments take root in our diagnostic skills - observation, listening, and reading the pulses - all with attentive, nurturing presence of mind. Here, we hear you!